Where Will Himax Technologies Be in 5 Years? New growth initiatives haven't been enough to change the chipmaker's fortunes. The semiconductor business is a cyclical one. Think of many of the components used to build electronic devices as a man-made commodity, subject to wild swings in supply and demand, which in turn affect the pricing and profit margins that chipmakers fetch. For manufacturers to fight the ups and downs, it's all about diversifying uses for their products and technological advancement. That has been the angle for Himax Technologies (NASDAQ:HIMX), a maker of display drivers used in televisions, tablets, and smartphones. The company has found new uses for its drivers in ultra-high-definition TVs and in displays in cars, and it has several promising technologies powering new tech for smartphones. But none of that has alleviated the roller-coaster ride, and it's hard to see this stock doing anything but more of the same for the next half-decade. In the second quarter 2018, 82.6% of Himax's revenue was derived from display drivers. Small- and medium-sized drivers -- used in smartphones, tablets, and auto displays -- were 49.2% of sales. Large-sized drivers for televisions were 33.4% of the total. While all of those segments were up double-digits from the same quarter the year prior, as well as up from the first quarter of 2018, the figures are still well off of Himax revenue from a few years ago. TV and smartphone production ebbs and flows with new product launches, and seasonality to meet holiday shopping demand at the end of each year also has an effect. With so much of Himax's eggs in these baskets, the stock is on a constant see-saw and has been fodder for stock traders, who move in an out of positions, for years rather than a viable long-term investment. Himax knows the difficulties investors have with its bread-and-butter business, so it has expanded beyond the world of traditional display applications. One promising area has been the automotive industry, lumped into the small and medium display segment. In the second quarter of 2018, revenue for automotive applications was up 15% from the first quarter and more than 35% year over year, but at just 15.8% of the whole pie, displays in cars and trucks are merely offsetting weakness from other uses. That leaves Himax's non-driver chip business, which includes technology for things like augmented reality and virtual reality (AR/VR), wafer level optics for use in digital camera applications, and 3D sensing for facial recognition on smartphones and tablets. The small division -- 17.4% of revenue in the second quarter -- holds the most promise to help Himax return to sustainable growth, but that hasn't panned out yet. That's because some technologies within the non-driver division have had false starts over the last few years. Take the AR/VR industry as an example, which is still in a nascent stage. Himax held a key contract with Microsoft for work on the HoloLens AR helmet project, which was scaled back a couple of years ago to undergo further development. That helped knock the non-driver business off course. More recently, Himax has been working on 3D sensing tech with Qualcomm, which also hasn't panned out yet as Android devices have been slow to take up the facial recognition feature it enables -- made famous by Apple's first iPhone X. Management is confident in the promise of 3D sensing and says that sales will increase later in 2018, as Himax's comments in its recent pre-announcement of preliminary, unaudited third-quarter results bear out. "The company reiterates its belief that its businesses will be out of the trough starting from the fourth quarter," the company said in that press release, which also noted that third-quarter revenues were "$188.4 million, an increase of 3.9% sequentially versus guidance of around flat from the last quarter. The revenue increase in the quarter was attributed to greater-than-expected production output of the new foundries for large display driver ICs and TDDI chips which the Company introduced to address the industry’s foundry capacity shortage issue. As anticipated, the Company’s WLO shipment volume to its anchor customer also increased significantly against that of Q2 2018." Non-driver sales have been all over the board for years. Data source: Himax Technologies quarterly earnings. YOY = year over year. Five years is a long time, but until solid growth catalysts gain more traction to help offset the traditional display business and sustain overall growth, it's difficult to see Himax as anything more than a commoditized chipmaker. 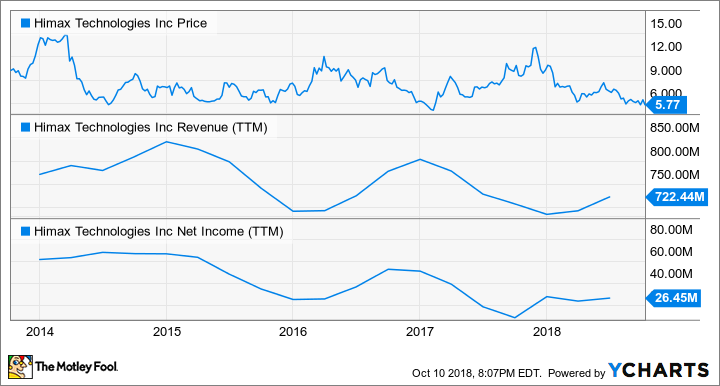 While it's possible to catch shares of Himax at the bottom of its frequent sales cycles and make some quick coin, long-term shareholders who don't want to babysit it should pass on this semiconductor stock.